Kove Kitchen, it’s one of my go to spots in Steveston for burgers, Belgian style beers, and waterfront views. I found out a while back that Kove does brunch, giggity! Brunch service runs weekends from 11am-3pm and features Kove’s awesome burgers along with breakfast dishes, small share plates and even a few salads ( what’s a salad?). 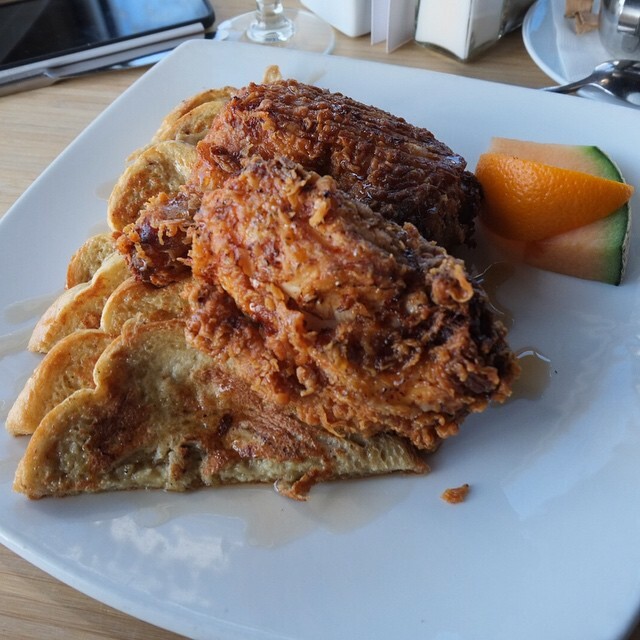 Kove does Fried Chicken and French Toast, a twist on the ever trendy fried chicken and waffles. You know what? French toast is better than waffles and I don’t care what you think about it. They soak up more syrup, they have a bit of cinnamon in the egg wash, and those 2 things send waffles crying to their mama. The fried chicken is made to order so you have to wait a bit but it’s worth it. tender, fresh, hot, well seasoned, good crunch. Really good fried chicken. Kove Kitchen is located at 3900 Bayview street, right on the water tucked behind Hog Shack Cook House, in Richmond’s Steveston Village.